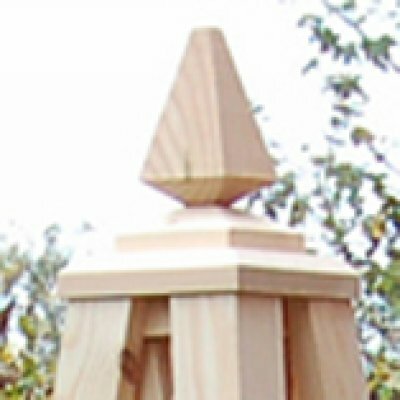 The Bolas Wooden Garden Obelisks are constructed from Scandinavian Red Pine. Their main vertical timbers are substantial and all connections are bonded with high quality waterproof adhesive for durability and strength. It is topped with a diamond shaped finial. An exclusive and attractive addition for your garden. 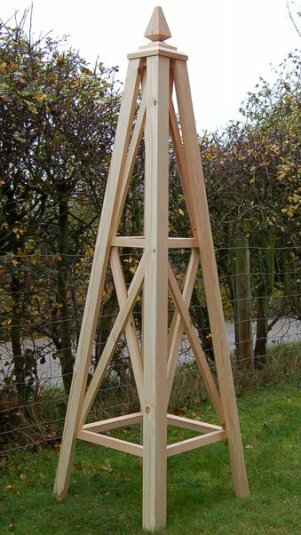 The Bolas Wooden Garden Obelisks are elegant Obelisks that stands 180cm tall and are 50cm square at the base. 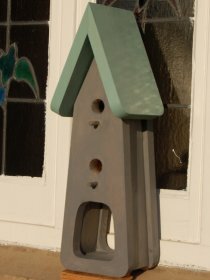 We also supply all our obelisks with eyelets and spikes to secure them to the ground. 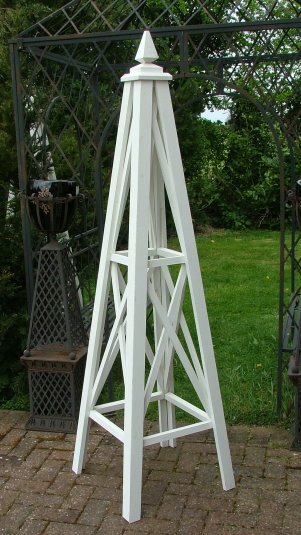 You can only use these if you are positioning the Obelisks on soil or grass. The standard finish is clear or Golden Brown preservative and we also offer Farrow and Ball exterior paint as a finish too. A garden obelisk is an excellent way to support and display your shrub roses. Just put the obelisk over the rose, and secure the obelisk with pegs or spikes in the ground and tie the rose's branches to it. This is relatively easy to set up but it is important to make sure the obelisk is safely secured to the ground so that strong winds will not blow it over. or rambling roses twist the main shoots around the uprights to encourage flowering shoots to form low down, it is also better to train the shoots in the direction of their natural growth, before they have matured and hardened, particularly necessary for climbers that have stiff or semi-rigid shoots. To fasten the rose shoots to the obelisk use rose ties or twine. It is good to use these because of the ease of loosening them when the shoots develop or for ease of releasing the shoots when pruning. When your roses have reached the top of your obelisk you should trim them regularly to make sure the rose keeps its shape.